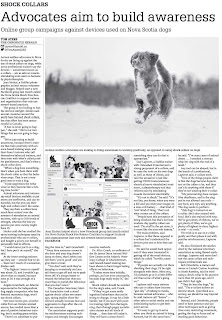 Welcome to the website of You Would be Shocked - an information clearinghouse for the dog owners of Nova Scotia who are thinking about what kind of training they want to use for their dog. This site will give you information about trainers who use science based dog training, we also talk about what is called "balanced training" - what it is, and let you know the difference between that and science based dog training. 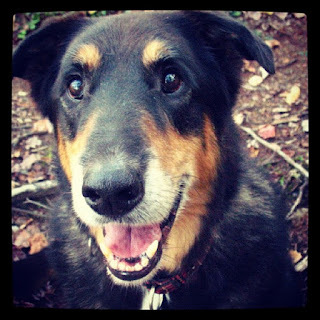 There are a lot of dog rescues who are using "balanced trainers" so we have a section of the site that talks about rescues in Nova Scotia who are committed to using trainers who use science based dog training - we believe it is very important - especially for rescue dogs who can sometimes come from traumatized situations. As well - we talk about the "5 Freedoms of Animal Welfare" - if you haven't heard about it before - it is a must read! There has been some local press around the shock collar initiative that's been started. 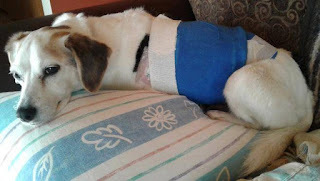 What do Advocates for shock/e-collar training say? Dog trainers who use shock/e-collars as their main protocol for training dogs are certainly excited and enthusiastic about it. Some of them are truthful with what they are doing - that the collars are negative reinforcement/positive punishment, but unfortunately others will tell you that they are part of a positive training protocol, which just isn't true. Looking on facebook - when people talk about shock/e-collars, it's interesting what people say when they are discussing why they use the devices and I'm going to quote why people say they are good and life-saving parts of their dog's life - a lot of people say that they'd have to euthanize their dog if they hadn't have started to use the collars, which is too bad. Too bad for their dogs, anyway. A new coalition between rescue groups has begun in Nova Scotia to build awareness about the humane and ethical treatment of dogs in our province. Electronic containment systems - the devices that either have wires that you bury in the ground or are wireless and transmit to a collar you put on your dog - work through the use of electric shock. You put the wires around the perimeter of your house and when your dog comes too close to those wires usually the collar will make a beep or have a vibration and if the dog keeps going the collar will then emit an electric shock to tell the dog to back off so that he does not leave your property. That is how things should go when everything is working as you want it to - but there are a lot of things that can go wrong. And I am going to lay out a few of those things. 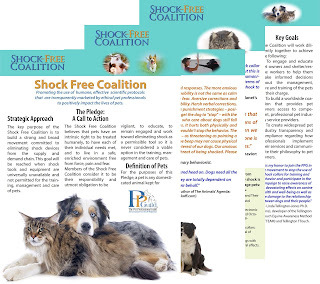 There is awesome news from the Pet Professional Guild - a consortiom of force free trainers around the world - has announced that on September 25, 2017 they will be rolling out their plans for a "shock free coalition". It is with great pleasure that I am now able to inform you that, on September 25, 2017, PPG will be rolling out its Shock-Free Coalition. This is an initiative that has been developed through the PPG Advocacy Committee over the last 12 months. Its aim is to build an international movement committed to eliminating shock devices once and for all. The Shock-Free Coalition will feature a Shock-Free Pledge, a signature drive, and the rollout of tools and resources to help you help us promote the initiative across our communities. The following is excerpted from the website "Pet Collar Awareness" - a Canadian website that's working to build awareness around dog collars and their abuse - there is a lot more information at that website - if you want to read their information in it's entirety - I suggest you go there to read it all - it is all really important - this is just some of the information that's written there. The "Hierarchy of Dog Needs" was developed by Linda Michaels, MA - you can read all about it on her website at http://www.dogpsychologistoncall.com/hierarchy-of-dog-needs-tm/ and an interesting thing about her website that you should check out is her "about me" page - it lists all her qualifications - it's huge - her credentials go on and on and on, unlike other types of trainers who have just gone to seminars and are basically just autodidacts and then from that consider themselves dog trainers. 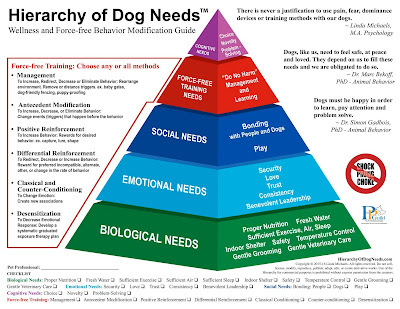 This Hierarchy of a Dog's Needs is a force free alternative to other types of dog training and meets all your dog's needs in terms of modifying behaviour and does it in a certain order so that your dog will feel safe, healthy, secure, and bonded with you - the most important thing in their life - which is how things are supposed to work. What are the positions of different rescues and the NS SPCA in Nova Scotia? 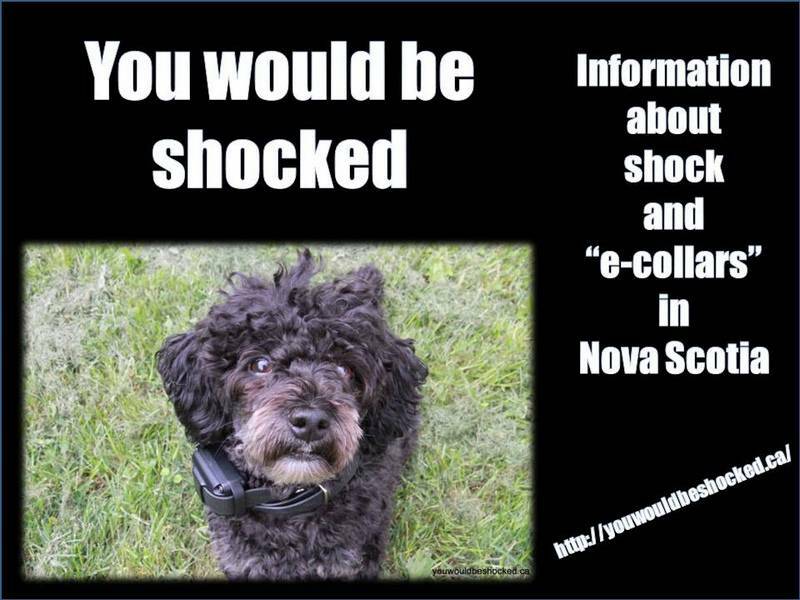 Some rescues in Nova Scotia do use shock/e-collars extensively, and that is too bad. We are not going to talk about them. But a lot of rescues don't use them. Here are the position statements of a couple rescues who don't use them. The Nova Scotia SPCA opposes the use of pinch, pronged or choking collars due to the physical damage that can occur to the trachea, oesophagus, vertebrae and brain of the dog, in addition to the psychological damage from pain and stress associated with such devices. 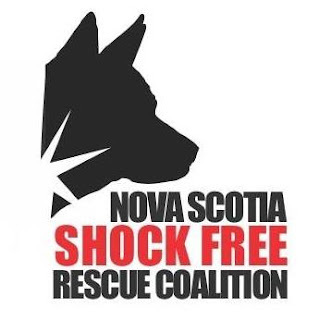 The Nova Scotia SPCA is also opposed to shock collars used for training or containment, because they cause pain and generate a fear based response (verses positive-reinforcement based training). The Pet Professional Guild is planning a new initiative effective September 25, 2017 - a shock free coalition - WORLDWIDE! What is "balanced training and What is Science Based Training ?" “It is my honor to join the PPG in the movement to stop the use of shock collars for training and behavior and participate in the campaign to raise awareness of the devastating effects on canine health and well-being as well as the damage to the relationship between dogs and their people." -Linda Tellington-Jones Ph.D. (Hons), developer of the Tellington TTouch Equine Awareness Method (TTEAM®) and Tellington TTouchTM. 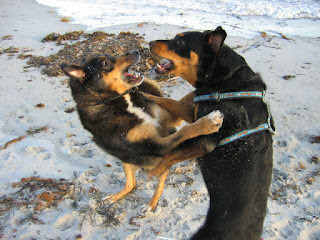 “The behaviors for which people wish to use shock in dogs are those that annoy humans. These behaviors are either signals or nonspeciﬁc signs of underlying distress. The question should be, are we doing harm when we use shock to extinguish behaviors, some of which may be normal? If one is considering the mechanism of cellular learning, the answer must be yes.” - Karen L. OverallMA VMD Ph.D. DACVB, editor-in-chief, Journal of Veterinary Behavior: Clinical Applications and Research. “I’m shocked to learn about shock collars and I support the drive to ban them.” Dr. David SuzukiPh.D., award-winning scientist, environmentalist and recipient of the Order of Canada.